Flores, in the wild northern region of Guatemala, is a both a starting point for other destinations in the area such as Tikal, as well as a destination itself. The quaint town on an island in the Peten Itza Lake has old-world charm, great restaurants and shopping, and beautiful vistas. The hostels listed here all offer a variety of amenities and other options for budget travelers, backpackers, and anyone looking to save some cash while having a great time. How much do hostels in Flores cost? Overlooking the lake and the main island part of the town (great view! ), this hostel has dorms as well as private bungalows in a delightful jungle setting. The central pool provides a nice place to socialize and meet other travelers, while the onsite restaurant and bar keeps you fed and relaxed. The very affordable bungalows all have their own front porches, and some have ensuite bathrooms. The owners and staff, who live on site, are extremely helpful and friendly. They can provide for your every need, as well as book trips and activities (such as to the ruins of Tikal). While the hostel is across the lake from the town, they can also arrange for boats to the town or other nearby spots. Other guest reviews claim that the facilities are very clean and well kept. Wi-Fi, laundry, and other typical hostel amenities are also available. They are also kid-friendly! A fun hostel for backpackers, solo travelers, and groups. The Yaxha provides a great social environment around a central restaurant and bar, and clean, comfortable rooms. They also have a Spanish language school, with a discount for guests. With dorm rooms and private rooms available, there is something for everyone. They also offer tours and trips to Tikal, other ruin sites, and other excursions around the lake area. Guests claim that this hostel is very fun and social with relaxing hammocks, comfortable rooms, friendly staff, great food, and a super-convenient location near the bridge. Wi-Fi and other typical hostel amenities are available. Note that private rooms are located in another building. This social and fun hostel in the heart of Flores has everything a traveler could want, including free paddle boards for fun on the lake! With dorms and private rooms with ensuite bathrooms, everyone will find their rooms to be clean, crisp, and in good condition. This multi-story building has a room at a good price for every type of traveler. The common room, communal kitchen and dining area, as well as the balconies overlooking town offer fun and social spots to relax and enjoy your downtime while you plan your next adventure. 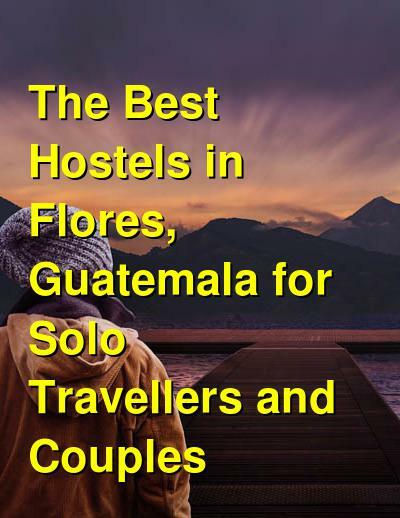 Naturally, the hostel offers trips and tours to Tikal. But they also offer a variety of other activities such as the previously mentioned paddle boarding trips on the lake and excursions to other nearby sites. They also offer air conditioning, lockers, Wi-Fi, a basic breakfast, and bicycles. Check out the photos of this new hostel in the middle of town. Overlooking the lake, the rooms of this new and modern hostel/hotel surround a central courtyard with a small swimming pool. The small dorm rooms all have their own private ensuite bathrooms, which are all new, modern, and clean. A terrace overlooking the lake makes for a great spot to sunbathe and meet other guests. And, there's a free breakfast! Air conditioning, Wi-Fi, an onsite restaurant and bar, a Jacuzzi, and laundry services are all on the list of amenities for this great new spot on the central "island" section of the town of Flores.